Guide: How to use Bias Fx Mobile..Live! First of all, I'm Italian, so be patient with my english..I'll try to do my best! I've always thought Bias Fx mobile as an amazing resource for live performances. I imagined the most common scenario to me: a guitarist playing live in a Pop/Rock band. 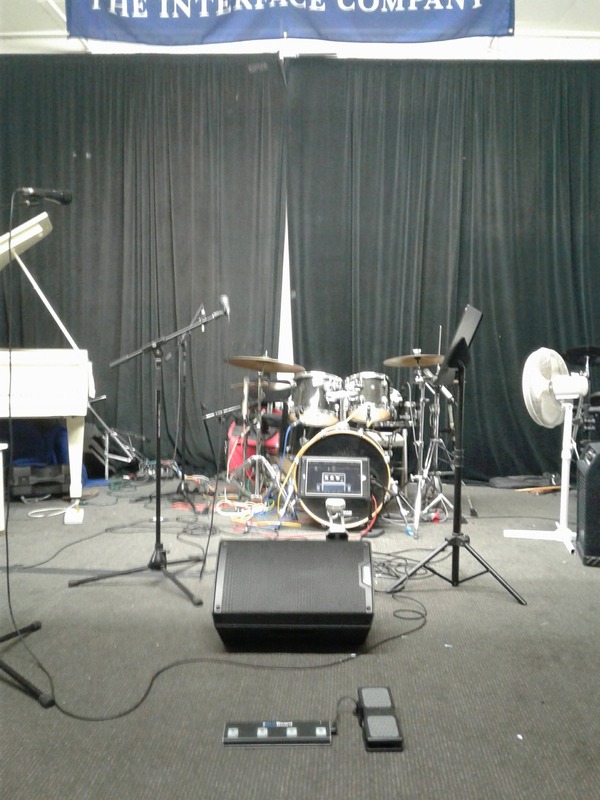 In my experience in a live concert a coverband usually performs about 20 - 25 songs. As guitarist usually you may basically need 3-4 type of sounds (Clean, light Crunch, Distorted for rhythm parts and Lead), basic ambient fx's (Delay and Reverb) and several modulation Fx's depending on the song. So the question is: How do I get all that in a practical and fast way? Most of the time when we use a real amp and a pedalboard we have to dance on our pedalboard to switch from a sound to another (unless you're using a mFx's or a looper). That can be very overwhelming and distracting since in the meantime you can't stop playing! Often you also have to remind the correct order of pedal to switch on and off in order to achieve a smooth transition between sounds. For this method I set a patch with everything I need for the entire gig. this setup is the same as having an Amp and a Pedalboard. You'll have to toggle on/off pedals one by one using your footcontroller. I reccommend this approach if you don't need too many fx's and pedals. cons: it's hard find a good balance with sounds. For this method you may want to use a clean amp and then add OD/Drive pedals in front of it in order to get dirty sounds. In theory this should work fine, but I'm not really happy with sounds I'm getting so far...it seems that a clean amp wants to remain clean and does not like very much OD/Drive in front of it. You can achieve better results using two amps and the A/B switch in the path. In this way you can set a Clean amp and a Crunch/Hi-Gain for distorted rhythm. You can still use an OD on the clean amp for light crunch sounds and on the Crunch/Hi-Gain for Lead sounds. Same as the first method, but you need to assign on two of your remote controller's switches functions "next patch" & "previous patch" in order to navigate thru the patches. In this way you can setup a patch for each song with the exact type and amount of amps/pedals you need. cons: same as first method plus: assigning 2 switches on your remote controller for patch navigation, you'll have less switch available to control other functions. I really like this one. It's like to have a mutlichannel amp and a pedalboard or MFX. In this way you can set a patch for a specific sound and this is where Bias Fx shines. Once you found the "perfect" clean sound you can keep it as it is and recall it when you need it. Also, keeping a patch ready with all drive pedals and amps set on theit sweet spots give you a lot better results in terms of sound rather than try (as we have seen in method 1 and 2) to get different sounds from an amp using drive pedals in front of it. It's really hard to find a good balance and a good sound for everything in that way. the more is the time I spend on Bias Fx the more I understand that every amp sounds better if it is used for what it is supposed to be. If you take a Clean amp don't expect to be able to get a great lead tone from it by adding a couple of drive pedal in front..it just does not work as right as using a High-gain amp instead. 3 - auto save: If for instance you've memorized your Clean patch with Delay on, when you go forth and back to that patch you'll always have the delay on even if you switched off before moving to another patch. I personally would prefer an auto-save option to select when using this method so that patch memorizes settings you left when you moved to an other patch .. Unfortunately Bias Fx can't receive program change messages, so you can't recall a specific patch from different banks, this means many things and.. it's a shame I know..but hopefully a future release of Bias Fx will fix this. I wish there were 30 banks slots available but actually they are only 8. This means that if use one bank for each song, you can setup at most 8 songs. So, dipending on your tracklist you may need to create one or more additional bank folders. The annoying thing as you may guess it that you'll have to manually select the bank folder you need on the fly..
Have you already tried similar approaches or other? hmm I'm not having any "bang" switching from clean to distorted amp in dual mode....have you tried adding a noise gate at the beginning or the signal path? I tired a few different things that normally work for this sort of thing, like using the eq as a high pass, but no real luck. I think until we get auto engage for the wah, I will probably keep using tonestack for that part, so I can use their channel switching and clean section and use Bias FX for the amp. Here is my setup for convenience in that the only cable I actually have to plug in at a show is a single power cable! Everything that can be is wireless and battery powered. The iPad is held in place with a scissor tablet holder, really adjustable and nice, but I'm open to other ideas. 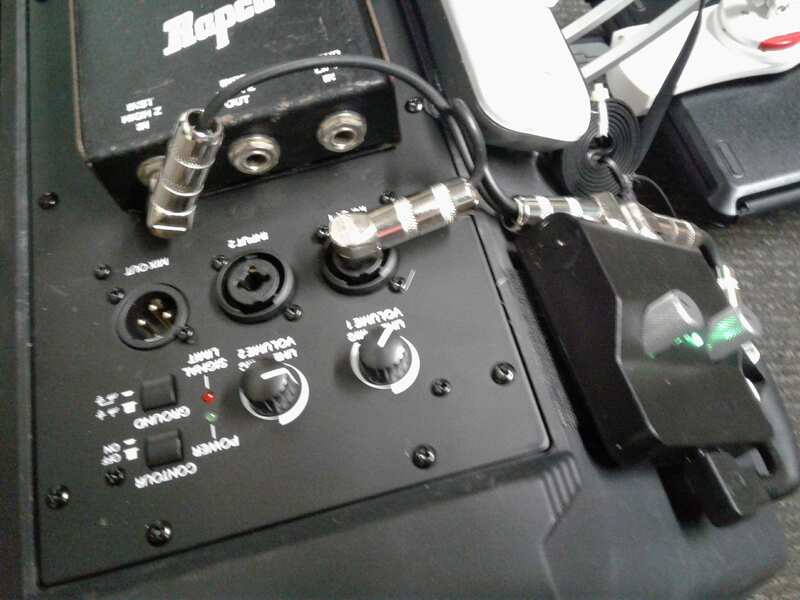 The audio interface (in this case a Sonoma Wireworks StudioJack Mini) and wireless receiver (Line6 G30) are velcro'd to the speaker. 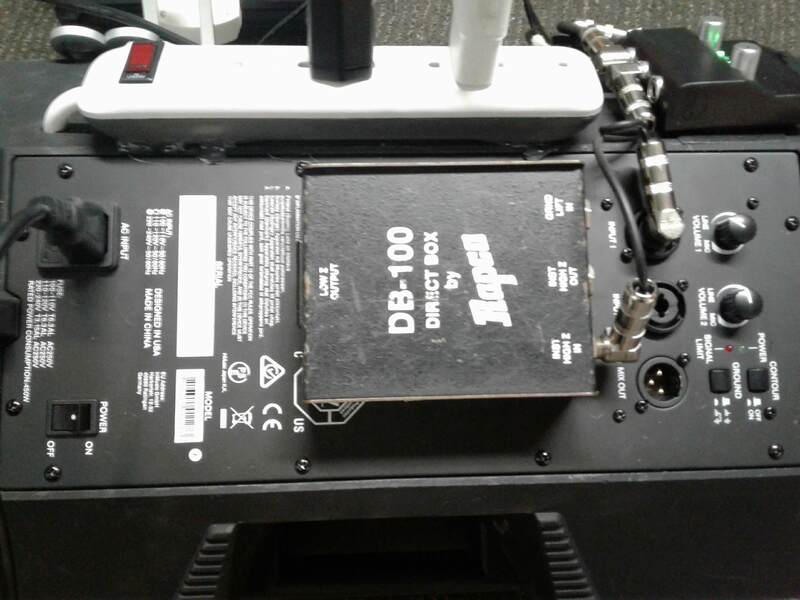 This will most definitely void your warranty, and there are other ways to do it, but in my case, I drilled a hole in the speaker cabinet and soldered a powerstrip to the A/C input of the speaker. Note that the A/C input is unswitched, which is why I opted for a switched power strip here. 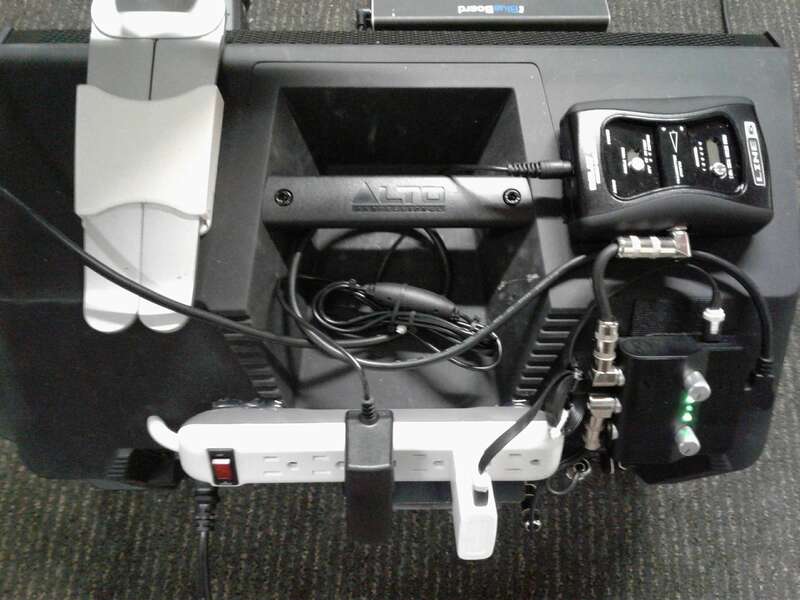 I hot glued the power strip to the cabinet. 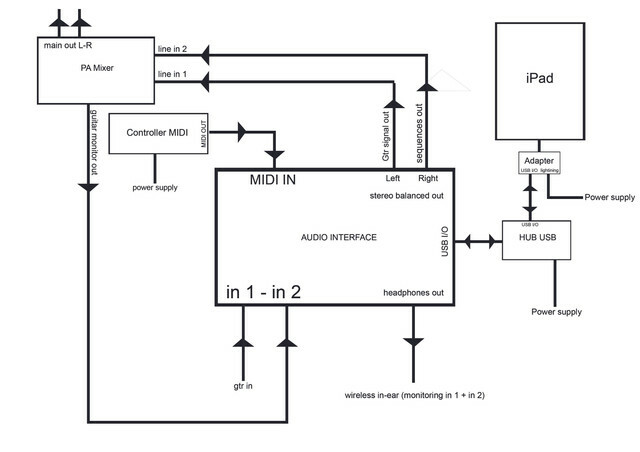 In my case, the stereo TRS out of the Audio Interface goes to the Speaker input and the DI input. Add some right angle plugs if need be to really clean things up! In my case, the venues I usually peform at, have always backline, soundmen and PA, so I didn't looked for a FRFR system. 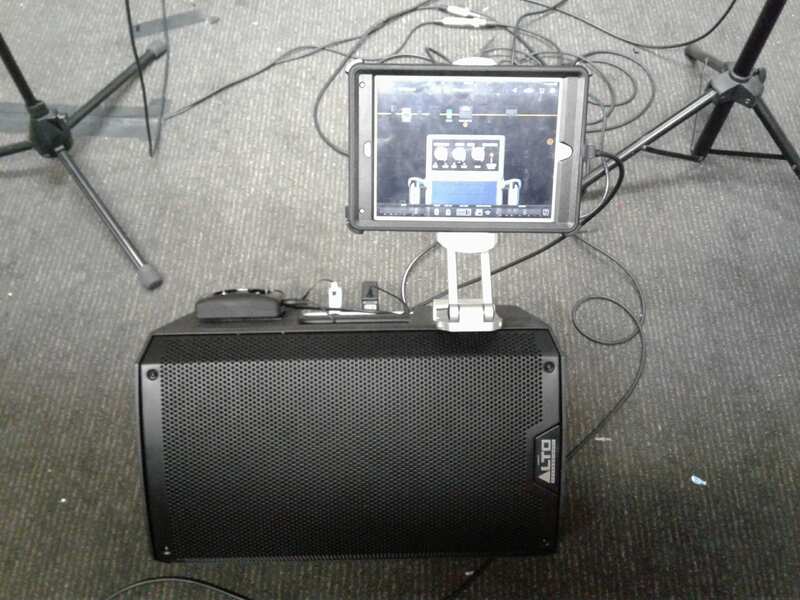 The reason why I opted for this system is that it allows me to travel bringing with me only a guitar bag and everything I need (ipad, audio interface and remotecontroller) in it...very handy! If I should bring with me anything more, at that point I would prefer to use a real amp and pedalboard. in this way I can mix monitor signal and guitar signal at my taste and listeng to them from my in-ears. Thanks for sharing this. This is really useful. I personally use a mix between option 2 and option 4 but I would like to take a change of option 3. Doing live I connect my interface (IRig) directly to a sound board, what is your preference for this?